What does it take to be a genetic material? A molecule that can act as a genetic material is expected to fulfill the following criteria. Replication: It should have the ability to replicate itself. Stability: It should provide a stable storage for genetic information. Evolution: It should have the ability to evolve and change itself. Expression: It should be able to express the information when needed. Now, we have the eligibility criteria for the genetic material. 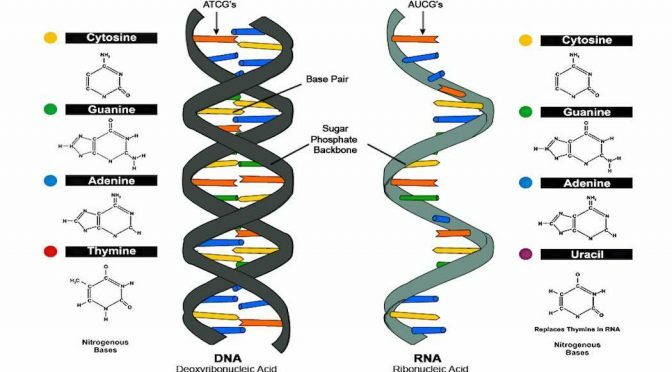 So, let us examine each requirement one by one and compare DNA and RNA for these functions. Which is better at Replication? Replication occurs when a strand acts as a template for the synthesis of new complementary strands. This is possible only when there is the presence of complementary base pairing between the two strands of nucleic acids. It is already known that the complementary base pairing is present in both the nucleic acids i.e. DNA and RNA. Thus, both of them have the ability to direct their duplications. However, DNA has an upper hand in replication, as it is able to replicate with very high fidelity because on average there occurs only one mistake per every 109 & 1010 bases. Also Read: Who discovered that DNA is the Genetic Material? Which is better in Stability? The genetic material must be stable so that genetic information can be passed from one generation to another without any change during different stages of the life cycle of the organism. Now, let us see which is more stable? DNA or RNA. 1. The presence of 2’-Hydroxyl (-OH) group on RNA. RNA, however, is a stable molecule as the presence of negative charge (–ve) on the sugar-phosphate backbone protects it from attack by Hydroxyl ions (OH–) that would lead to Hydrolytic cleavage. But, the presence of 2’-Hydroxyl (-OH) group makes the RNA susceptible to Base-catalyzed hydrolysis. Moreover, RNA is also prone to Auto-Hydrolysis when it is single-stranded. This spontaneous cleavage reaction takes place in basic solutions, where free hydroxyl ions in solution can easily deprotonate the 2’-Hydroxyl (-OH) group of the Ribose sugar. However, if this 2’-Hydroxyl (-OH) group is removed from the ribose sugar than the rate of such base-catalyzed hydrolysis is decreased by approximately 100 fold under extreme conditions. Thus, the presence of 2’-Hydroxyl (-OH) group on every nucleotide of RNA makes it labile and easily degradable. 2. The presence of Thymine at the place of Uracil in DNA. The only structural difference between Thymine and Uracil is the presence of a methyl group in Thymine. This methyl group facilitates the repair of damaged DNA, providing an additional selective advantage. Cytosine in DNA undergoes spontaneous deamination at a perceptible rate to form Uracil. For example, under typical cellular conditions, deamination of Cytosine to Uracil (in DNA) occurs in about every 107 Cytidine residues in 24 hours, which means 100 spontaneous events per day. The deamination of Cytosine is potentially mutagenic because Uracil pairs with Adenine and this would lead to a decrease in G≡C base pairs and an increase in A=U base pairs in DNA of all cells. Over the time period, the Cytosine deamination could completely eliminate G≡C base pairs. But, this mutation is prevented by a repair system that recognizes Uracil as foreign in DNA and removes it. Thus, the methyl group on thymine is a tag that distinguishes thymine from deaminated cytosine. But, if DNA normally contains Uracil recognition would be more difficult and unpaired Uracil would lead to permanent sequence changes as they were paired with Adenine during replication. So, we can say that Thymine is used in place of Uracil in DNA to enhance the fidelity of the genetic message. In contrast, RNA is not repaired and so Uracil is used in RNA because it is a less expensive building block. Therefore, the DNA is more stable than RNA. Which is best suited for Evolution? To act as a better genetic material, one needs to provide the scope for slow and gradual changes that are required for evolution. Among nucleic acids, both DNA and RNA are able to mutate or change its sequence. But, RNA being more unstable mutate at a faster rate and many pieces of evidence suggest an intimate link between rapid mutations in an individual organism and the process of aging and carcinogenesis i.e. rapid mutations can be carcinogenic and leads to faster aging. This may be the reason shorter lifespan of viruses as they mutate and evolve. While DNA does change but at a very slow rate under normal cellular conditions which do not prove to be harmful in the longer run. Also Read: How a 2 meters long DNA is fitted into a 2 micrometers Nucleus? Which is better in Expression? Expression of genetic information is also a necessary criterion that should be fulfilled by a genetic material. Between both the nucleic acids, RNA can directly code for the synthesis of proteins, hence, can easily express the characters. DNA, however, is dependent on RNA for the synthesis of proteins (translation). Over the period of evolution, the protein synthesizing machinery has evolved around RNA can easily express itself in the form of proteins. Store information with better stability. Undergoes slow changes and can resist rapid ones (mutations). But, for expression DNA needs RNA for protein synthesis, which is then transcribed from DNA sequence. From the above discussion, we can conclude that DNA is preferred for storage for genetic information and RNA is better in the transmission of genetic information. Biochemistryrevisited.blogspot.in,. ‘Biochemistry Revisited: Why Is DNA (And Not RNA) A Stable Storage Form For Genetic Information?’. N.p., 2015. Web. 25 Sept. 2015. Wikipedia,. ‘RNA Hydrolysis’. N.p., 2015. Web. 25 Sept. 2015. Previous PostAll You Need To Know About Organ Transplant.Next PostHow Diseases are Emerging and Re-Emerging? Points are in both for and against of both of the topics.